Categories: Air, Air Disinfection, Mold. Tags: mold removal spray, gelair tea tree oil solution. Gelair Tea Tree Oil (TTO) Solution is specially formulated to clean cooling coils and affected surfaces for mold, bacteria, and viruses. The solution acts as a universal cleaner but has the additional beneﬁt of sterilization and providing long-lasting protection from these pathogens. Tea tree oil, the main component of the solution, is an antimicrobial and antifungal agent. Gelair Tea Tree Oil (TTO) Solution is recommended for application on aﬀected surfaces to provide for better mitigation, prevention against harmful microbes as previously mentioned and rid these areas of musty smells. The penetrating action of tea tree oil in the solution stops the growth of mold on porous surfaces, such as grout and silicon for up to 3 months. 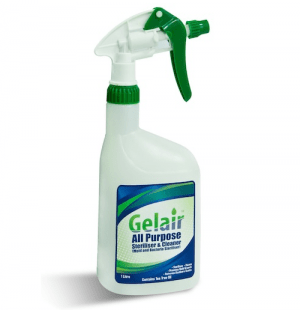 Gelair solution is available in both 1 liter and 20 liters, perfect for applications from domestic households to the indoor environment of large organizations. I thought it was a bit pricey compared to others but this stuff really works. Been using it on my kitchen and furniture. Does an excellent work in removing mold. Purchased twice already since it can also be used to wash moldy clothes and leather garments.. the smell is quite nice too since it's using tea tree oil. BEST SOLUTION TO REMOVE MOLD! I have tried different products and I tell you it's hard to find a mold remover that really works. Glad to have stumbled upon this product while I was looking for a solution on the internet. Works really well and will recommend everyone to try it out. Thank you!